I will be showing this game at Origins, but I did not inform any of the publishers I am meeting with about it… mostly because I didn’t think it would be ready. I could develop on this game for years to come. There is so much I can tweak, but I don’t want to do that anymore. I’m not saying things won’t change, but I am going to start getting publisher feedback to help me with tuning the game. Well… that’s exactly what happened. A huge publisher took my game, played it, showed a great deal of interest in the game, and asked me to develop on it a bit further… under their direction. Now, before I continue, I want to preface this article with a bit of a disclaimer: I asked permission to write about this process. Not all publishers appreciate designers writing to the world about their business practices. Not all publishers want games they are considering to be shared with the world. When the game left my hands, I quit writing about it out of professional courtesy. When I asked if it were okay for me to write, the publisher was really excited about the idea. He said he’s not sure why some people chose to work behind curtains, but he was perfectly fine with me sharing… and I think there are some interesting lessons and/or anecdotes that have come from this experience. I’ll still be leaving out names, however… that’s just me being professional. With that out of the way, let’s dive into what happened. 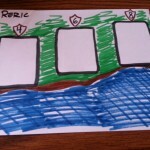 At Origins I was told that my game wouldn’t be played until after GenCon. I understand that publishers are busy and time is short and I was perfectly willing to wait months (or longer!) if that’s what it took. I was a bit surprised when only a few weeks passed and I received a follow-up email. They had played the game… many times in fact… and loved it! They enjoyed the theme, the length, the way the dice and cubes worked, the engine building… all of it. They wanted more… and by more, I mean that they wanted to see what else I had up my sleeves. So, we’d like to see more/different card/effects, and I’d like you to consider the following drastic change to your game. Imagine, if you will, that we eliminate the center display. 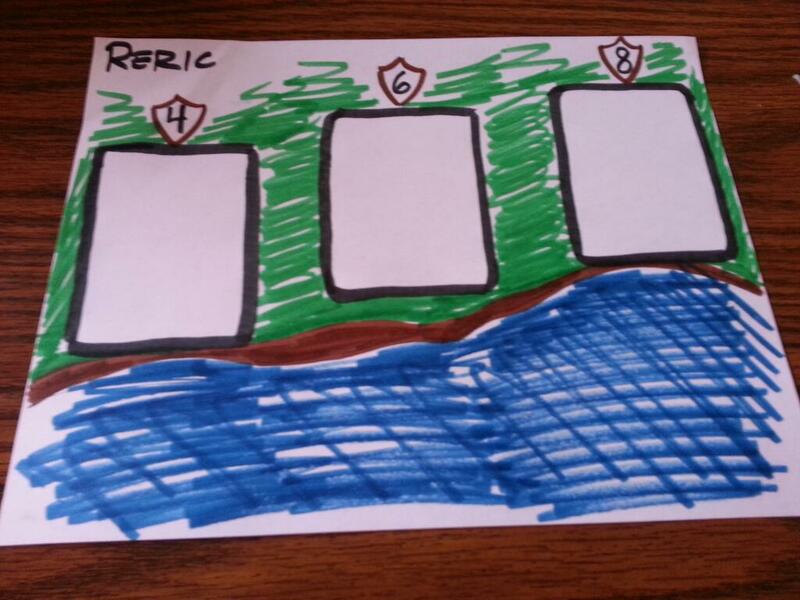 Instead, we have three (or so) “villages” available for pillage. These are created by flipping over the top card of the Holdings stack, counting the number of icons on the card, and placing face-down cards underneath it so that the total number of cards (1 faceup + facedown) is equal to the number of icons on the faceup card. We create two new ship types: 1-coin scout (look at a facedown pile), a 2-coin warship (1 attack) and a 3-coin warship (2 attack). Warships require a cube (crew) to man them. 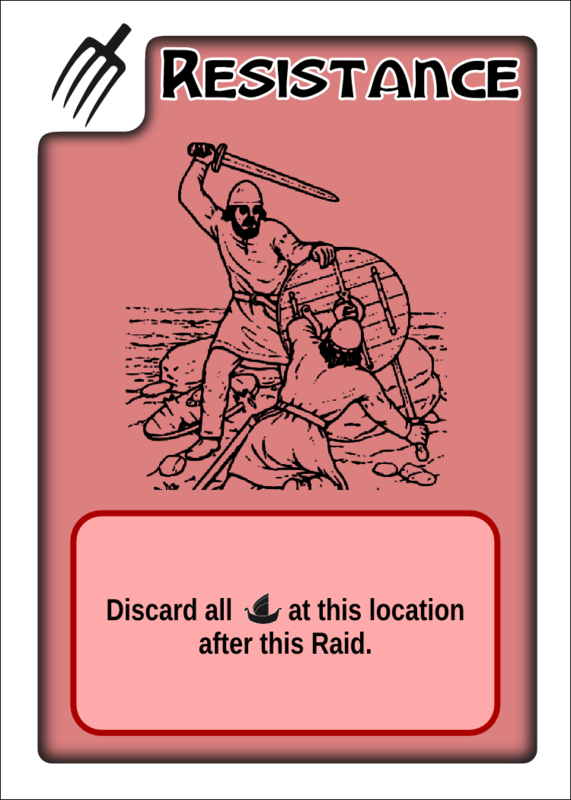 On a turn, you may assign warships to raid villages (villages’s strength are equal to, or some fixed amount more then, the number of icons). When the attack strength is met, the village is sacked. Reveal all cards, and from most to least strength in the battle, take a Holding. Ties are resolved clockwise from active player, or based on number of ships (2 1-attacks are better than 1 2-attack). You have the option of keeping the Holding, or discarding the holding (possibly even selling the Holding to another player?). Replace the village. You now have a building area, and a completed area. Incomplete buildings are limited to some number. Victory is similar to now. I’m not going to lie… I was a bit overwhelmed by this at first. From the very beginning, I had latched on to the idea that we are competing, with our goods, to buy things. That was the core mechanic that I thought was the most fun. I latched onto it and wouldn’t let it go… and I tried to force it. Every iteration of this game has been trying to convince players to compete for the items available in the middle. 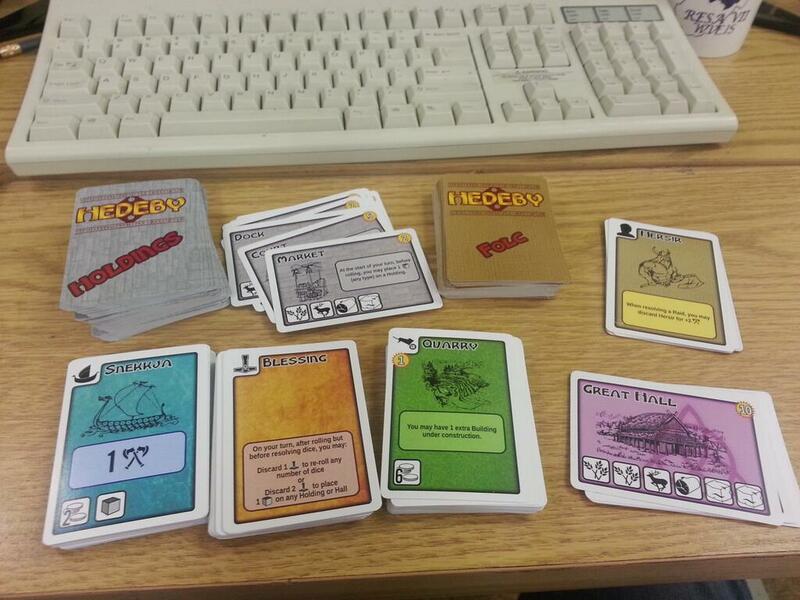 I added requirements to cards so that you would have a reason to buy one thing over another. I added direct-conflict abilities to make it harder to be squatted. In the end, however, it never worked. The best option was to always just roll dice, see what you got, and buy whatever you could. There was never a real incentive to try for one building over another. This seemingly drastic change from a professional developer finally shook me enough to see it. What I really wanted all this time was a dice game that let me control the dice… that building my engine would help me take control of the randomness. – The game is yours to do with as you will. Submit it elsewhere, and we’ll be disappointed, but no hard feelings. – This is a reflection of the amount of development that we perceive needs to be done on the design. It’s not that what you have is bad; quite the contrary, what you’ve got is a very enjoyable game. We think that there’s room for improvement, and that room is what will take the game from enjoyable to great. – The development work being proposed is significant, and we’d prefer that you do the legwork to get the design back to high-functioning. This work will let us see how potentially publishable the design is (and how much work will still be left to fine-tune the design). – We, however, are willing and eager to test any steps along the way, and to provide feedback as appropriate, with the understanding that you won’t be showing it to others if you do want our direct input along the way. – Ultimately, here’s the takeaway: You have a game that with additional development, we would likely be eager to publish. We want to see this design with us, and will curse the name of anyone who gets this before we’ve had a full chance to say yes or no. We’re in no rush, as our dance card’s pretty full for the next 18 months or so, so we’d like for you to take the feedback you’ve got, decide if it works or does’t for your design, and ideally come back with an even better game that we’ll have no choice but to acquire. You’ve got a theme and a mechanic that we like; we just need it a bit further down the road to know just how good it is, and we’d prefer you to do that work (keeping your flexibility) than us sitting on it for a few months without movement before we can return to the design for further development. I’ve never really heard about a situation like this. I mean, there are people like Eric Lang that have built careers as freelance designers, but I’ve not heard of it happening to a designer working on their own products. Usually, the freelancers are working on designs for a specific IP or at the direction of the publisher with specific criteria. This time, I submitted a game of my design, and the publisher is offering to help me develop on it. If this happens often, people must just not talk about it. I read every bit of design blogging I can find and I’ve not heard of this type of arrangement before with a traditional publisher. So, where are we? Well, there is no official agreement. I’m not working “with” the publisher per se… I’m working to develop my game based on their ideas. The best way I can describe this is that while there is no contractual obligation to each other, we have a sort of unspoken arrangement that I will continue to develop the game, with their input, and I will not be showing it to other publishers before this publisher has had a chance to make a final decision. If they ultimately decide to pass on it, all the development work we’ve done is mine to take with me. It’s actually a pretty perfect arrangement that I’m more than happy to work through. In the weeks leading up to GenCon my brain wouldn’t sleep. I literally laid awake at night thinking of their suggestions and how I could build on them. A great deal of the development leading up to GenCon happened late at night in my bed. Villages – Like they suggested, we eliminated the center area where players were “competing” to build things and instead turned that into piles that we could fight over. I decided that these piles should be of fixed size and be completely face down with no revealed information. I assigned them arbitrary defense values that seemed to “just work” when testing: 4, 6, 8. The defense value is also equal to the number of cards that are in that pile. This means that going for the 8 gives you a better chance of getting what you want… but it requires more silver, more boats, and likely more players to be involved. Raiding – I took their exact suggestion and built the 3 ships that are used to raid villages. This part really didn’t change. What did change is that there needed to be some churning of ships. If they all just stay out, the players have no reason to buy any after a few turns. So, after each raid, all scout ships are lost and each player must also discard one other ship. 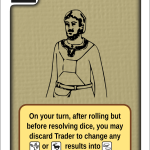 I also realized that this mechanic opened up some flexibility with the deck… I added a few events called “Resistance.” When a village is raided and it contains a Resistance card, all ships at that village are lost. Suddenly, scouting became a bit more important! 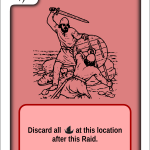 The People – now that there was this draft mechanic to get buildings, the first few turns of the game revolved around obtaining silver. The problem was, if you didn’t roll silver on those first few turns, you were basically out of luck. There was nothing to spend your goods on. 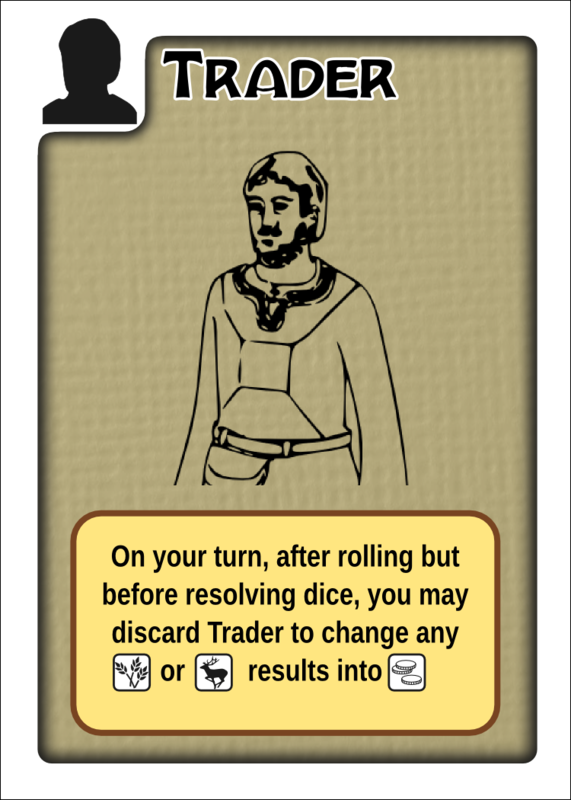 This problem weighed on me until one evening… while sick… I had a fever-dream that solved it: “I’ll add a deck of Folc!” At first, these Folc were just going to let you sell some goods for Silver and then be discarded. I realized quickly, however, that this deck opened up potential for a lot of neat little one-shot effects. There are Folc that add to your attack strength, let you re-roll dice, or even just give you points. To purchase cards from this deck, you need to spend 2 goods of any type. This gives you something to do with those useless goods each turn and also provides you with a needed silver boost at the beginning of the game. Testing this version was a blast. The game was suddenly what I wanted all along… I just had no idea how to get it there. 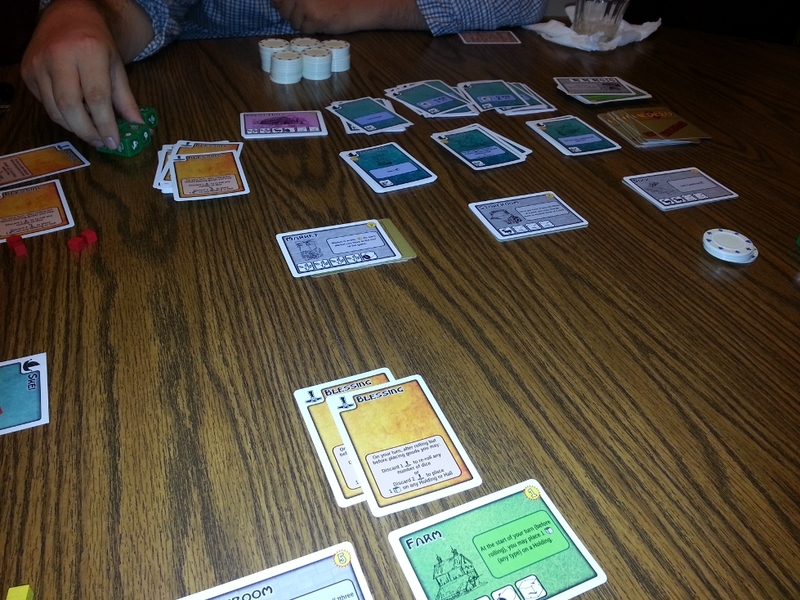 Players were now re-rolling dice and actually trying to accomplish goals each turn. There were no more lucky rolls that stole the hard work of other players. You no longer felt at the mercy of the dice, but instead you had control over your destiny. There were clear goals each turn, but also clear paths to the end game. 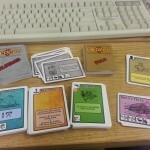 As GenCon approached, I put together a solid test version and ordered a copy from thegamecrafter.com so I could have a nice shuffle-able prototype. Also, this beast had become over 200 cards and that takes a long time to cut and sleeve! I reached out to the publisher and asked if we could meet up and try this version together. I wanted to be sure that what I was doing was right for both of us and I didn’t spend the next 6 months developing something that ultimately didn’t work for them. The good news is… the last minute crunch was worth it… but that’s for another story.